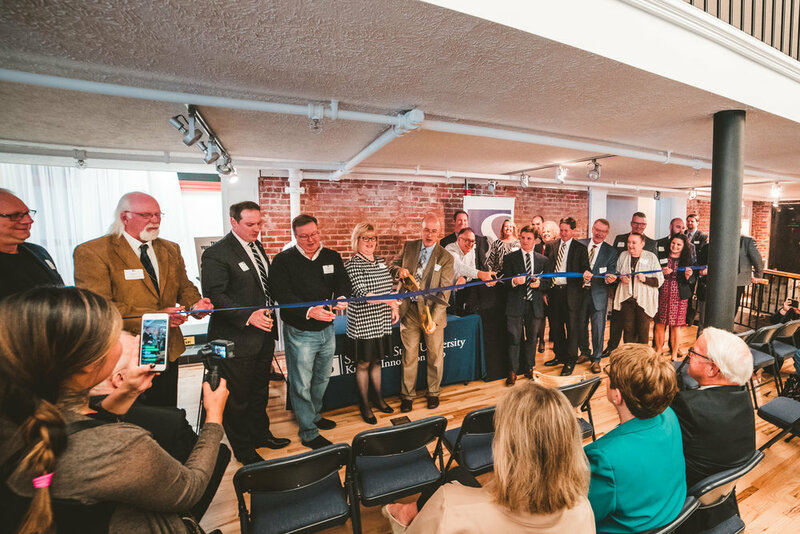 Shawnee State University is a leader in regional entrepreneurship through our new Kricker Innovation Hub now open on Chillicothe Street in downtown Portsmouth. This is a landmark facility that promotes entrepreneurship, innovation, and creativity in the region. Our ribbon-cutting ceremony was a success! We held our ribbon-cutting ceremony September 28. Thank you to all who attended, and especially to our donors, friends, and partners who helped make this day possible! We help businesses and entrepreneurs grow and bring their ideas to tomorrow’s market. We’re fortunate to have an experienced group of individuals giving their time through our Advisory Board. Meet our Advisory Board here. Southern Ohio’s home for innovation. Innovation has returned once again to the site of the former Sanford, Varner & Co. Factory Building at Third & Chillicothe Streets. Find out more about the building's history. Learn all you need to know about the different programs offered by the Small Business Administration. Eric Zimmer, host of The One You Feed podcast (as well as founder of several other startups and projects), will be at the Kricker Innovation Hub on Tuesday, April 16, to talk about his journey! Shawnee State's Entrepreneurial Journey Speaker Series is made possible by a grant from the Charles Koch Foundation. The event seeks to build local creative, social, and business networks all while recognizing community leaders and those who are making a positive difference in Portsmouth as well as the surrounding region. Techstars Startup Weekend Portsmouth will take place at the Kricker Innovation Hub April 5 - 7! This is a 54-hour immersive experience that will provide participants with a wealth of knowledge and resources to learn what it takes to start a business. Find out more at startupweekendportsmouth.com. This FREE workshop is designed to assist companies who wish to become certified as a Disadvantaged Business Enterprise (DBE), Small Business Enterprise (SBE) Minority Business Enterprise (MBE), Encouraging, Diversity, Growth & Equity Enterprise (EDGE), and/or Veteran-Friendly Business Enterprise (VFBE). This workshop will also explain how certifications are utilized to open your door to more business with the Ohio Department of Transportation.